Except for the Survival Products non-TSO'd rafts, all include a locator light to help with locating the life raft at night. However, bear in mind that these are primarily designed to assist survivors in locating the raft, not to assist Search and Rescue forces. The location light is the same water activated type used on aviation life preservers. It is relatively dim. While SAR might have night vision equipment which would make it stand out better, survivors only have their own Mark I eyeballs to see it with and that isn't likely to be easy in adverse weather. With the exception of the Winslows with their "righting locator light," forget about it if the raft is upside down as the water activated chemical battery is out of the water and even if it worked, you couldn't see it. The rafts with self-inflating canopies put the light on top of the canopy. Air Cruisers, Winslow and the BFGoodrich 10- and 12-person rafts also have another light inside for general interior illumination, which helps a bit, though it is worth noting that these lights are not very effective for such lighting because of their inherent design which doesn't provide the sort of even level of illumination one might expect from a typical light bulb. The locator light on the EAM raft was ripped off the tube by one of our volunteers during boarding. EAM does provide a second light, stored in a plastic bag and attached to the raft lifeline where it might be found. A point of attachment is provided on the canopy, once erected. Hoover's locator light is attached with a metal snap and users are expected to move it from the tube location to the canopy once it is erected. This assumes that the canopy is installed correctly as there is only a snap at one entry. Our testers got it backwards at least once. How much could another snap cost? The RFD Navigator has a SOLAS style water activated locator light fitted to the peak of the canopy. There is no interior light. The TSO'd exterior locator light for the RFD "R" series raft is located on the top of one canopy arch. 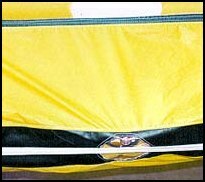 Until the canopy is raised, it is on the side of the raft, underneath the cover protecting the canopy arch tube. A small clear plastic "window" is over the light and the window itself is bisected by the exterior lifeline. Depending on how it is packed, the light may or may not be located directly behind the lifeline. Bear in mind that this "mushroom" style light depends upon the light's lens to focus the low intensity level beam to meet the higher intensity requirements of the TSO. The light is primarily emitted in a narrow beam from the sides and directly out the top. Movement of the item the light is attached to is supposed to sweep the narrow beam over a wide area. Since the light is covered up and mostly shielded and ineffective, except for the top, and since it is held down on one side of the raft until the canopy is raised, which depending on weather may not occur and in any case generally wouldn't occur until all survivors are on board, this installation does not appear to meet the TSO requirement (TSO C70a 4.12) ". . . and visible from any direction by persons in the water." The light is powered by a lithium battery which is mounted on the outside of the canopy arch, near the bottom where it attaches to the buoyancy tube. This battery can be switched off, conserving the light, a great feature, but it is not easy to reach outside on the canopy arch, however the reversible nature of the raft requires it to be outside. There is no interior canopy light, though I was told by the factory that there is an option for one. Seems like a raft of this expense could include a interior light as standard and lack of one is a serious drawback. All Winslow's rafts without a canopy include a TSO'd locator light on the top of the tube to the right of the boarding aids. Canopied rafts include both an interior and exterior light mounted on the canopy arch tube in the center of the raft. Winslow also offers the option of a canopy arch mounted strobe light, an excellent addition to any raft and one I highly recommend. Unfortunately, it isn't an automatic unit. An ACR Firefly 2 strobe is retained inside of a pocket on the canopy at the top center and must be switched on manually. Hanging from the canopy arch tube is a bright yellow laminated placard with clear instructions for activating the strobe. BFGoodrich also uses TSO'd lights inside and out, but there is no interior light on the 4-person raft, a serious deficiency in our opinion. On the larger rafts the exterior locator light is on top of one arch tube and the interior light is on the underside of the other arch tube. It seems to me it would make more sense to put the interior light in the middle of the raft. The locator and interior lights on the Air Cruisers rafts are secured with a metal snap. For the exterior light this should work fine because the canopy goes over the light and will help hold it down. On the interior, which is located off center, however, this allows the light to hang down and point sideways, somewhat reducing its effectiveness. On the other hand, it also makes it easy to unsnap and focus the light where needed, within the limited range of movement provided by the wire keepers. If the keeper was carefully cut, allowing more free wire length, then it could be more useful. The advantage is that using the interior light like this reduces the need to use up the batteries in the flashlight. I believe the requirement for a TSO'd light is obsolete and manufacturers should be able to use any light that meets or exceeds the TSO performance requirements and is acceptable to SOLAS, the USCG or some other recognized regulatory or standards setting agency. The lensed TSO'd lights are particularly poor choices for interior lights where an even distribution of light is desirable. Water activated chemical batteries continue to be the first choice of most manufacturers due to long storage life and small size and weight. They have the disadvantage of not being able to be readily turned off. Since they have an average life of about 8 hours, if you ditch dearly enough during the day, they will be much help at night. However, someone knowledgeable might know to remove them from the water and drain the water so they cease functioning. However, in most cases, they cannot be removed because they are more or less permanently affixed. Battery operated lights can be switched on and off and used when needed or appropriate and conserved until such time. It is patently stupid to not include an ELT (Electronic Locator Transmitter) or EPIRB (Electronic Position Indicating Radio Beacon - the marine equivalent of an ELT) in the raft, in our opinion. The ELT in the aircraft is going to do no one any good once it sinks. On the open water an emergency beacon is relatively easy to track and find and is the quickest way for SAR to effect a rescue. An ELT is required for extended overwater Part 135 operations (FAR 135.167(c) No person may operate an airplane in extended overwater operations unless there is attached to one of the life rafts required by paragraph (a) of this section, an approved survival type emergency locator transmitter.). TIP: What many do not realize is that the standard 121.5 MHz ELT is not very effective in many areas of the world, particularly near the equatorial regions and in the southern hemisphere where satellite coverage isn't as good. We believe that a 406 MHz ELT or EPIRB. (These units also transmit a 121.5 homing signal) is far superior and strongly recommend them to all users, for anyone flying in these regions it is even more critical. While expensive, it is also a lot more effective, providing a much more powerful 5 watt signal and much more precise locating by the COSPAS-SARSAT satellites, along with positive identification of the aircraft in distress when properly registered. The 406 MHz beacon is particularly valuable outside the northern hemisphere where its advantages are multiplied. For a comparison between the 121.5 MHz and 406 MHz beacons, check out the USCG EPIRB page. Finally, we should note that satellite alerting for 121.5 signals is being phased out, yet another reason not to depend upon a 121.5 beacon to save your life. From a practical, as opposed to regulatory, standpoint, an EPIRB or PLB (Personal Locator Beacon) is probably just as good as an ELT for raft operations here it isn't required by regulation and generally a whole lot cheaper. While it need not meet the high G requirements of the ELT, if there are survivors, the EPIRB packed inside the raft will be fine, provided reasonable care was taken not to crush it while packing the raft. What an EPIRB or PLB cannot offer is the auto-deploying capability that is incorporated into some of the available survival ELTs. No survival beacon is included with the non-TSO'd rafts. No ELT was included with the TSO'd Part 135 equipped EAM, Survival Products, or Hoover rafts. How that meets the requirements of the FARs is a puzzle to us. An auto-deploying 121.5 ELT is optional on the Part 135 RFD "R" series raft equipment list. Our sample raft was equipped with the ELT which is attached to the side of the boarding ramp in a foam padded pocket. This allows the water sensor, a length of flexible wire with the sensor on the end, to function, no matter which side of the reversible raft is up. A length of wire connects the ELT with the strip antenna that is glued to the adjoining canopy arch. This arch is either laid down beside the raft or, when erected, is at about a 40 degree angle from the vertical. The ELT manufacturer, Artex, says that with the canopy down the ELT signal would certainly be picked up by an aircraft overhead or close by, but they couldn't guarantee it would be picked up by a COSPAS-SARSAT satellite. They went on to say that unless the antenna was more or less vertical, they wouldn't guarantee it would function properly to specification or be received by the satellites. The further off vertical, the more loss of signal strength. Even with the canopy up, Artex wouldn't absolutely guarantee it would work 100% of the time at that angle. Any way you look at it, operation of the ELT is compromised. This is a significant failing in our opinion. Air Cruisers offers a DME auto-deploying 121.5 ELT as an option. The ELT is attached to the upper interior face of the lower buoyancy tube. The short whip antenna is attached to the upper tube by the entry. On our rafts the antenna was bent over, which could compromise the ELT's signaling capabilities. The ELT wires are exposed for the most part on the interior and subject to being damaged, which would render the ELT useless. Testers commented that the ELT was uncomfortable if they had to sit against it. Winslow used to include a self-deploying 121.5 ELT as standard equipment on all TSO'd rafts. Since our tests, they have changed to optional ELTs for competitive pricing purposes. Recognizing the superiority of the 406 MHz ELT, Winslow has worked with DME to develop an auto-deploying 496 MHz ELT in a compact package. Our rafts were equipped with prototype 406 ELTs that were essentially the same size and shape as their existing 121.5 ELTs. The revised prototypes of the production units are rounder and smaller and fit inside the raft better. With the advent of this 406 ELT, Winslow no longer plans to offer a 121.5 unit. The prototype ELTs were installed in the same manner as the usual 121.5 ELTs. The ELT itself is attached to the lower buoyancy tube in a manner similar to Air Cruisers, but it is tucked up tighter into to joint and therefor seemed significantly less objectionable to testers. It was also padded with a full Velcro covering and thicker fabric, which may also have helped Only short lengths of wires are exposed where they connect to the ELT. The whip antenna is located next to the canopy arch tube on top of the upper tube where it has room to stand erect. A laminated placard attached to the ELT provides clear instructions for manual use and switching. Winslow offers the option on all its rafts of a manually operated ACR 121.5 MHz. mini-EPIRB or a 406 MHz. EPIRB. The BFGoodrich rafts were with auto-deploying 121.5 DME ELTs. The ELT was installed in a pocket on the outside of the raft, on the lower buoyancy tube on the larger rafts, on the upper on the 4-person. Getting it out of the interior certainly helps as far as comfort goes, but it also could reduce somewhat the available battery life if it is cold out there. The whip antenna is mounted on the interior on top of the upper tube next to a canopy arch tube. The wires are more exposed than we'd prefer. An auto-deploying ELT is the way to go, in our opinion. Even if the survivors barely get themselves in to the raft, the ELT will be summoning help without any need for the survivor to do a thing. We also think that Winslow's move to 406 MHz ELTs is a giant step forward.